Finding Seminyak hotels on the beach is a need to enjoy all the beauty of Seminyak. This awesome destination of Bali is full of magnificent beaches. Many travelers always come to this destination to enjoy its panoramas. Not only the panoramas, the ambiance, culture, attraction, and even the cuisine attract many visitors. To make your perfect trip to a perfect place be the most perfect adventure, you have to stay in a perfect place too. Seminyak has many choices of accommodation and all of them will give you the perfect experience. Read the following information and get your perfect Seminyak hotels on the beach. 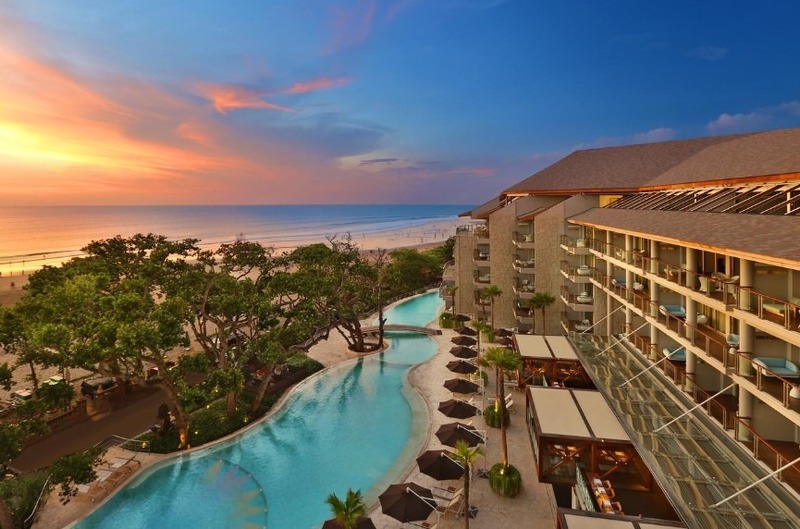 On your first perfect list of Seminyak Hotels on the beach is Double-Six Luxury Hotel Seminyak. This luxury hotel is located near the beach and you can closely enjoy the beach. The facility is comfortable. The room is nice with a luxurious bathroom. It is also complete with TV and air conditioner. Wi-Fi connection is also provided for you. Further, you can also enjoy and relax at the swimming pool. The infinity pool directly faces the ocean. The view is magnificent and worth to stay here. Moreover, the cuisine here is also luxurious. You can order Italian and Western food. The other facility is the gymnastics center. Keep on exercise there keeping your perfect body well in exploring Seminyak. In addition, to reach this hotel you only need 5 km drive from the airport. On the second list, let’s come to Jambuluwuk Oceano Seminyak. This hotel offers a comfortable place to stay with a nice view of the outdoor pool. Located only a few minutes from the beach. Staying here gives you easy access to explore Seminyak. Further, let’s talk about the facility of this hotel. Each room of this hotel is comfortable. With TV, air conditioner and personal balcony, you can keep relaxing on your private area. The bathroom is also comfortable to use. Wi-Fi connection is free to use. Some Seminyak beach destinations can be visited only in a few minutes. Even you can walk to reach your destination. Explore Petitenget beach which is only 800 meters from this hotel. In addition, this Bali accommodation is only 8 km from the airport. If you like shopping, it is also only several minutes from Seminyak Square Shopping Mall. 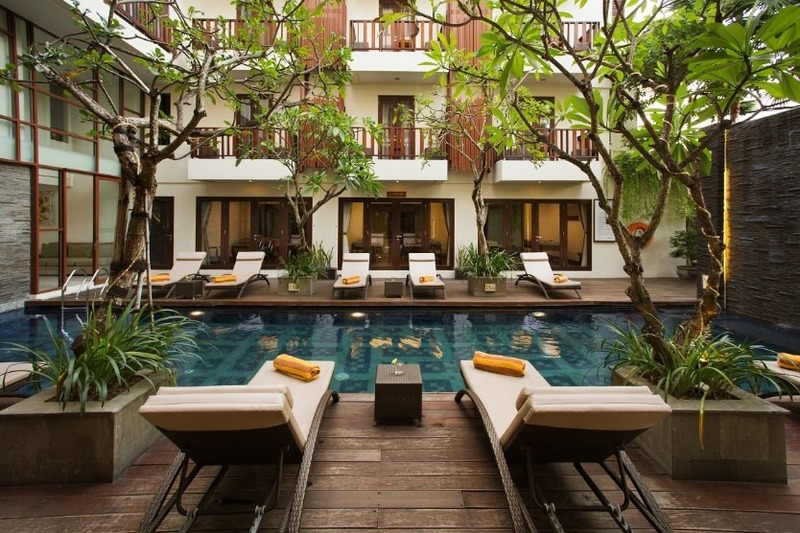 Next, for your perfect beach hotel in Seminyak, There is Sense Hotel Seminyak. It is a nice hotel with comfortable service to stay. Located only 13 minutes from the beach, it is appropriate for you to explore Seminyak beaches. Further, you have to know about the facility of this hotel. It has a swimming pool in the middle. You can relax and enjoy swimming there. This hotel also has massage service. You have to try it to keep you fit. Furthermore, if you are hungry, you can explore the area surrounding. It is full of cuisine choices and you will like to taste it all. Moreover, the room is complete with air conditioner and swimming pool. The bathroom is also comfortable. Each room also complete with coffee maker and minibar. Then, to facilitate your need for internet, you can freely use the Wi-Fi connection. Another destination like Oberai is close too. You can reach this hotel only in 20 minutes drive from Ngurah Rai International Airport. 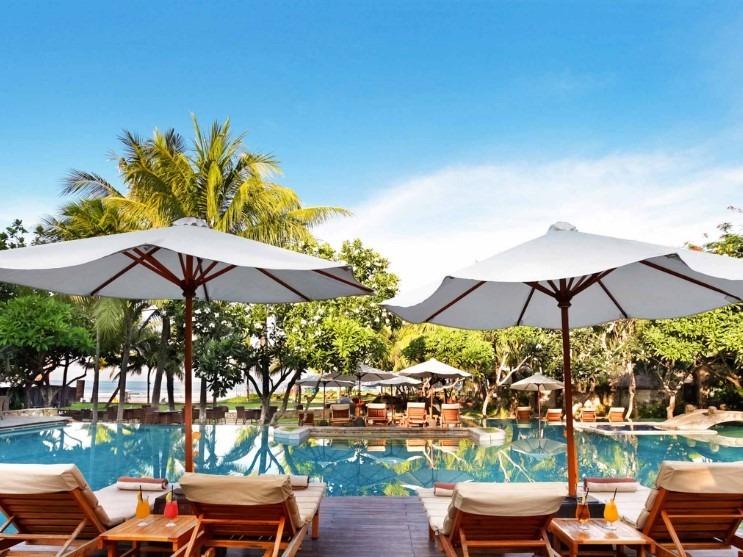 Another perfect option to stay in Seminyak, The Royal Beach Seminyak Bali – MGallery Collection. It is a villa with Seminyak beach as the free attraction you can enjoy. Located at the seaside and only 4 minutes from the beach, this accommodation is perfect the explore Seminyak beach. The tropical style decoration also adds your comfort to stay longer. Further, a luxury place must be having a luxury service for the customers. Let’s see what is inside this awesome villa. Each villa has large and comfortable room. With a free Wi-Fi connection, TV, and nice bathroom. No wonder there are many tourists like to stay here. Besides the room facility, you can get a private swimming pool. This swimming pool is nice if you enjoy it while having a spa at the edge. Moreover, this perfect place also provides nice and delicious food. Buffet food is ready to satisfy you. You can also order the Mediterranean and Japanese food. If you want, the room service is ready 24 hours satisfying your need. In addition, Ngurah Rai International Airport is only 4 km away from this accommodation. 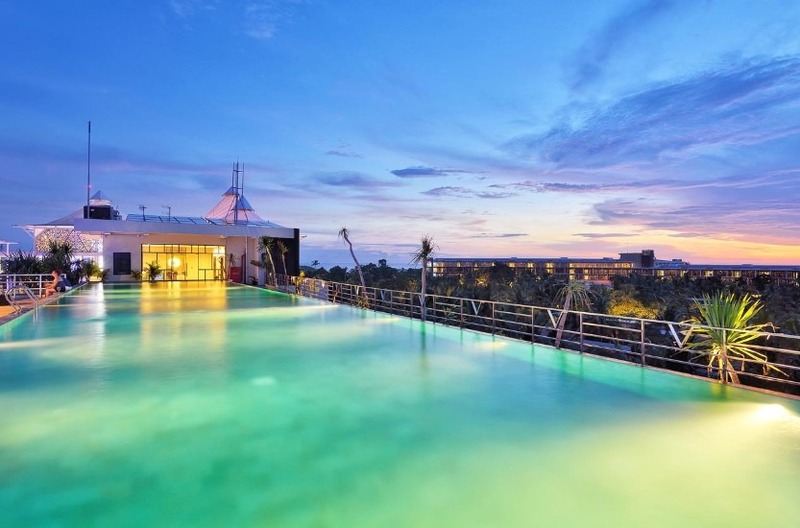 Famous for the outdoor pool, this Luna2 Seminyak is the next perfect option to stay in Seminyak. This awesome Bali accommodation also has a nice restaurant and a bar on the top of the building. Located only 30 minutes from the beach, it is perfect to spend your holiday here. Besides the awesome offer, it also has perfect facility to serve you. Each suite has a complete facility with colorful trendy design interior. Nice bathroom with comfortable tools make you stay longer to wash your body. Television and Wi-Fi connection are also ready. Furthermore, a perfect accommodation is always accompanied by a perfect restaurant. The cuisine here is delicious and you have to try it. You can enjoy western food which is addicted to trying. In addition, mini cinema is provided to give you best entertainment ever. This accommodation is only 25 minutes from Ngurah Rai International Airport. 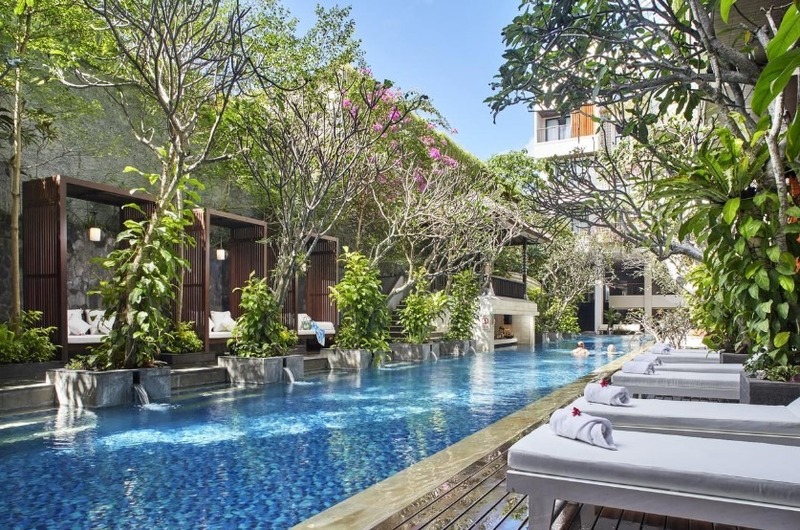 On the last list, there is DevinSky Hotel Seminyak. This hotel offers an outdoor swimming pool with an Elegant and Stylish model. You will like to stay here. All the room here is comfortable and beautiful. It complete with Air conditioner, Television, and Wi-Fi connection. The inside bathroom has bathtub and shower. Further, one interesting thing here is the restaurant. You can enjoy the beautiful scenery at Blue Sky restaurant while eating your meal. Then, there is also sauna facility. Try it and feel the best treatment there. In addition, this accommodation is only 20 minutes from the airport and 5 minutes from Seminyak shopping Centre.